What Day Of The Week Is June 9? 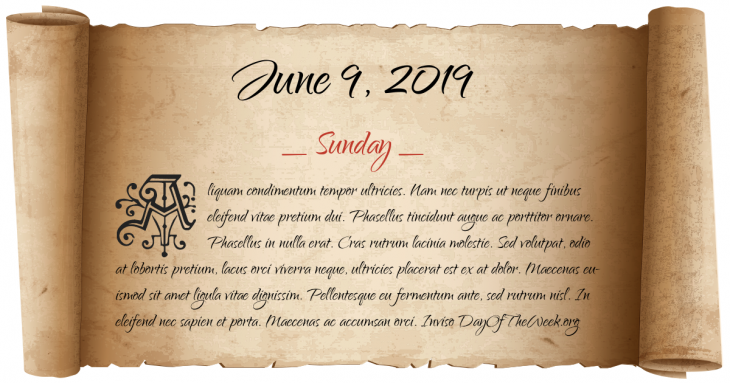 June 9, 2019 is the 160th day of the year 2019 in the Gregorian calendar. There are 205 days remaining until the end of the year. The day of the week is Sunday. Roman Emperor Nero commits suicide, after quoting Homer’s Iliad, thus ending the Julio-Claudian Dynasty and starting the civil year known as the Year of the Four Emperors. American Civil War: Stonewall Jackson concludes his successful Shenandoah Valley Campaign with a victory in the Battle of Port Republic; his tactics during the campaign are now studied by militaries around the world. Chicago Tribune reporter Jake Lingle is killed during rush hour at the Illinois Central train station by Leo Vincent Brothers, allegedly over a 100,000 USD gambling debt owed to Al Capone. World War II: the Soviet Union invades East Karelia and the previously Finnish part of Karelia, occupied by Finland since 1941. King Bhumibol Adulyadej ascends to the throne of Thailand. He is currently the world’s longest reigning monarch. Flint-Worcester tornado outbreak sequence: a tornado spawned from the same storm system as the Flint tornado hits in Worcester, Massachusetts killing 94. Portugal and the Soviet Union establish diplomatic relations. Thomas Sutherland is kidnapped in Lebanon (he will not be released until 1991). Who were born on June 9?